Last week I spotted somewhere on the web an announcement about the digitization of a particularly lavishly illuminated medieval manuscript with a legal text, the Decretales Gregorii IX, the major collection of papal decretals issued in 1234 by command of pope Gregory IX. The manuscript from the fourteenth century which prompted me to write this post is commonly called the Smithfield Decretals (Royal 10 E IV). At the British Library in London the digitization of manuscripts is a project on a vast scale, first of all in view of its rich and manifold collections concerning many themes, periods and countries. A blog dedicated to news on digitized medieval manuscripts at the BL helps you to stay informed about the progress of digitization for manuscripts from a particular period. The BL even advertises a smart phone application for the Royal manuscripts, but this app will no longer be supported. In this post I will look at legal manuscripts digitized by the British Library. Even if the absolute number of relevant manuscripts is really small, an overview of them might be useful. The variety of periods and legal systems merits attention. To redress the balance I will take into account here also illuminated manuscripts with legal texts for which the BL has digitized at least a number of pages or illustrations. A comparison of the search functions of both catalogues is included, too. At the end of this post it might perhaps be possible to conclude which legal text could be scheduled as a new addition to the eBook Treasures of the British Library. Some people will like to know as quickly as possible about the things that make a search interface more effectively or hamper its working. For once I agree in starting with a negative remark: the detailed view with the description – and most often a detailed bibliography – of a digitized manuscript at the BL seemed at first to lack a permanent web address. When you save the URL of this view – without noticing the tiny notice “Show link URL” – and you try to reopen it in a new tab or window you cannot access it anymore. A redirection notice appears, and you have to enter your search again. Thus the link I provided in the first paragraph to the Smithfield Decretals is not the link to the detailed view, but to the first page of the digitized manuscript Royal 10 E IV itself. I will give below the correct links to the full descriptions. In the manuscript view you will find a summary of the content placed at the top of the screen. You can search for manuscripts either using a quick search with two fields, keywords and manuscript numbers, or using the advanced search interface with search fields for keywords, manuscript number, title, author/scribe, provenance and acquisition, and bibliography. The papyrus with the complete text of the Athenian Constitution is the subject of a recent post at the BL’s manuscripts blog. What strikes me most while searching for these manuscripts is the lack of concise categories added to the description of a manuscript. Of course I realize the difficulty in adding systematic descriptors when dealing with composite manuscripts and convolutes. The sheer number of manuscripts in the British Library has as one of its consequences that some manuscript descriptions can be rather outdated, but newer descriptions are often very detailed. Some legal texts surfaced really by chance. I looked for the exchequer when I found Harley 1498, an agreement concerning the royal burial chapel at Westminster. This indenture is not a chirograph, a charter split into two or more parts, but a book with indentures. A second part of it is kept at the National Archives, E 33/1. The coronation book of the French king Charles V (Cotton Tiberius B VIII) can serve as a reminder that a coronation is a ritual with legal elements in it. The texts of French coronation ordines have been edited anew by Richard A. Jackson (ed.) , Ordines Coronationis Franciae: Texts and Ordines for the Coronation of Frankish and French Kings and Queens in the Middle Ages (2 vols., Philadelphia, 2001). After repeated searches with a substantial number of very different search terms with a clear meaning for legal history I still have not found more than this tiny sample from the immensely varied and large manuscript collections of the British Library. I hesitate to include here a fragment of farming memoranda of Ely Abbey from the first quarter of the eleventh century (Add. 61735). The New Minster Liber Vitae from Winchester (Stowe 944) does contain the text of some charters and the will of King Ælfred, but these legal texts are not the core of this manuscript. For some manuscripts guidance can be found online in repertories, and sometimes even at a specialised blog. Greek manuscripts clearly get special attention in London. The Zonaras blog for the history of Eastern Christian canon law is a very useful guide to this field, and I am happy to point to it for more information about authors such as John Zonaras and Theodoros Balsamon. Manuscripts with text concerning Byzantine law are the subject of two German repertories which are available online at the Max-Planck-Institut für europäische Rechtsgeschichte in Frankfurt am Main. You can download PDF’s of both the Repertorium der Handschriften des byzantinischen Rechts, Teil I: Die Handschriften des weltlichen Rechts (Nr. 1-327), Ludwig Burgmann, Marie-Theres Fögen, Andreas Schminck and Dieter Simon (eds.) (Frankfurt am Main, 1995), and the Repertorium der Handschriften des byzantinischen Rechts, Teil II: Die Handschriften des kirchlichen Rechts I (Nr. 328-427), Andreas Schminck and Dorotei Getov (eds.) (Frankfurt am Main 2011). Both books were published in the series Forschungen zum Byzantinischen Rechts; more PDF’s of some publications in this series can be found at a special subdomain of the website of the Frankfurt institute. English legal manuscripts are being catalogued by the untiring efforts of Sir John Hamilton Baker. He did this also for the Taussig collection with many English manuscripts now at the Lillian Goldman Law Library of Yale University [John H. Baker and Anthony Taussig (eds. ), A catalogue of the legal manuscripts of Anthony Taussig (London 2007)]. The Catalogue of Illuminated Manuscripts at the British Library does quickly dispel any misgiving about the percentage of legal texts among the various manuscript collections. Let’s not overdo things here, and first go to the origin of this post, manuscripts with decretals or commentaries on papal decretals. Here, too, you can choose between a quick general search and an advanced search mode. A search for illuminated manuscripts with decretals yields 35 records. For each manuscript you can go to a page with thumbnail images and summary descriptions of the illuminations. Often you will find more detailed images, too. Thus choosing a scene using this overview from the bas-de-page illustrations of the Smithfield Decretals is even easier than using the complete digital version of this manuscript. The illustrations in the lower margins present often consecutive scenes and tales. In August 2012 Alixe Bovey (University of Kent) contributed a very interesting post on the decorations of this manuscript to the BL’s manuscripts blog, ‘Finishing the Smithfield Decretals’. Some books have only penwork flourishes at the beginning of chapters. Among these illuminated manuscripts with decretals I would like to single out Harley 2349, a manuscript written between 1340 and 1450 with papal decretals and statutes of England. The manuscript Royal 10 C IV with the Abbreviatio Decreti Gratiani by Omnibonus, written between 1198 and 1202 has penwork initials and some additional drawings in the margins. Omnibonus’s name made me remember the Omne Bonum, the illustrated encyclopedia by James le Palmer, a clerk of the Exchequer (four volumes, Royal 6 E VI and 6 E VII, written around 1360-1375). As for other legal texts in illuminated manuscripts you will have to pick your choice from a wide variety of manuscripts, from books with only one decorated initial to manuscripts with lavish almost full-page illustrations in historiated initials. Let one example suffice, the Statuta Angliae. This text and other statutes can be found in nearly sixty illuminated manuscripts. Hargrave 274 (written around 1488) contains the Nova Statuta and is probably the most elaborately illustrated example. Harley 947 (first half fourteenth century) with both the Statuta Angliae and the text of the Magna Carta deserves mentioning for its picture of a lawyer speaking to an assembly. The Catalogue of Illuminated Manuscripts is truly a treasure trove, even if the manuscripts of the Cotton collection have not yet been included. When searching for an image with some relevance for legal history you find yourself here with a mer à boire. Legal iconography will not come back empty-handed from searches at this website or in the Online Gallery of the British Library. It is surely possible to include the BL in a comparison of online image resources of major research libraries, something that might be really interesting. In particular the use of taxonomies such as Iconclass might come into view when comparing different databases. A comparison with a portal such as Manuscripts Online: Written Culture from 1000 to 1500 would be equally valuable. In this post, however, I wanted to give due attention to the world’s second largest library and its manuscript holdings. I invite you to use its resources for yourself and to choose a manuscript that deserves digitization, or even inclusion among the showcases. The British Library has much more to offer, and I am sure this library will be present again in future posts. A very substantial number of digitized manuscripts with legal texts held in the British Library is accessible online thanks to the recent edition project Early English Laws which aims at creating new editions of English laws issued before 1215. Among the 81 manuscripts selected within this project nearly forty are at the British Library. However, here only these pages are shown which contain relevant legal texts. Hopefully it will be possible to include them in their entirety as a part of the BL’s Digitized Manuscripts program. This entry was posted in Manuscripts and tagged Byzantine law, Common law, Illuminated manuscripts, Legal history, Legal iconography, Library blogs, Medieval canon law on December 13, 2013 by rechtsgeschiedenis. How to put life into history? History becomes alive when you can see or imagine real people. Having their names, knowing about their activities, their homes and work, beliefs and customs, facing laws or whatever happens to them, is surely the most powerful way to connect to history and to understand its importance. However, often you can find about people only data when you look at the groups to which they belonged. They might have been members of a guild, of a particular family, they might have followed similar careers or be supined for particular reasons. It is wonderful when you can combine both a personal approach and a more general way of looking at people’s life. In the field of medieval legal history it is increasingly possible to find information about the same people both in more general online databases and in more specialized databases. The particular historical auxiliary science dealing with people and their careers is called prosopography. In this post I want to look at some projects concerning medieval prosopography, and show some ways of tuning them to good use for legal history. Prosopography is a discipline developed for the study of Classical Antiquity. The very word has Greeks roots and means something akin to “writing the faces”. The Prosopographia Imperii Romani (3 vol., Berlin 1897-1898) by Hermann Dessau and other scholars is surely the most important pioneer work. The Prosopography of the Later Roman Empire (3 vol., Cambridge 1971-1992) edited by A.H.M. Jones and other British scholars extended the range well into the early medieval period, for it covers the years 260 to 641. These large-scale projects are nowadays accompanied by a number of smaller projects, some of them even available online either as digitized books or as searchable databases. For medieval history with a very substantial link to the Roman Empire you can use for example for the period 641 to 1025 the Prosopographie der mittelbyzantinischen Zeit, a website of the Berlin-Brandenburgische Akademie der Wissenschaften, and for the period 1025-1250 the online version provided by King’s College London of M. Jeffreys (ed. ), Prosopography of the Byzantine World (2011). At Bibliotheca Classica Selecta you will find a fine list of relevant works and websites concerning Classical Antiquity. In this post I will focus on the European Middle Ages, starting with England. One of the databases for early medieval history is the Prosopography of Anglo-Saxon England (PASE) which contains names and data on people living in England between the late sixth and the late eleventh century. The database is accompanied by a sister project for the Domesday Book (1086), PASE Domesday. In order not to write inside this post an entire account of the history and online representations of the Domesday Book I will restrict myself here to a reference to the Domesday Book Net and to the information at the website of the British National Archives. I did not see there a link to Coelweb where you can find a database on the continental origins of English landholders, 1066-1166. English ecclesiastical history is the subject of the series Fasti Ecclesiae Anglicanae 1066-1300 where you can search for ecclesiastical officers in the nine digitized volumes of the first series. At British History Online twelve volumes of the second series, Fasti Ecclesiae Anglicanae 1300-1541 have been digitized, too. You might try to combine the services of the first database with the Taxatio Ecclesiastica Angliae et Walliae Auctoritate P. Nicholai IV, a searchable online version of the edition from 1802 by the Record Commission of a uniquely preserved assessment of ecclesiastical wealth in England and Wales from the years 1291-1292. The second series can be combined for the archdiocese of York with the database for the York Cause Papers with cases from 1300 to 1858. For the period from 1541 to 1835 one can search for English clerics in the Clergy of the Church of England Database. 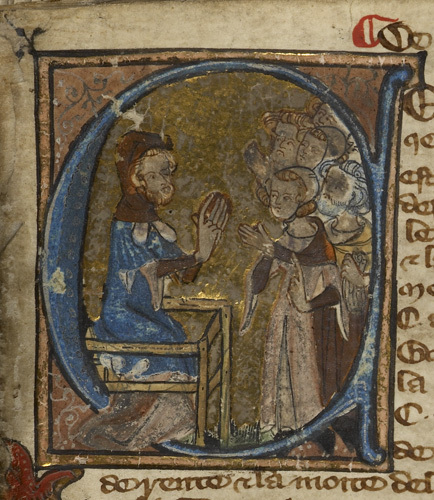 For Early Modern history the portal Connected Histories, British History Sources 1500-1900 can do splendid services, but without even much searching the legal history of medieval England is served online almost as good. As for Scotland it is well worth pointing to People of Medieval Scotland (1093-1314), launched last month. The project is connected with the projects on The Breaking of Britain (on the period 1216-1314) and the Paradox of Medieval Scotland (1093-1286). When you approach the Romana Repertoria put online by the Deutsches Historisches Institut in Rome online research comes really into its own. At this website scholars have combined the Repertorium Germanicum (RG) and the Repertorium Poenitentiariae Germanicum (RPG). The RG is concerned with Germans appearing in late medieval papal registers in the holdings of the Archivio Segreto Vaticano. The RPG deals with supplications from the late medieval German Holy Empire to the Cancellaria Poenitentiaria, one of the highest papal courts. Clerics asked this court for dispensation or even absolution after having committed offenses. In 1992 the Swiss scholar Ludwig Schmugge (Zurich) started this project, and it is remarkable to see an online database based on the paper publications so soon after their publication. Both databases enable you to look not only for German clerics and other Germans in an important source for the history of the papacy, but also to look at possible questions and cases about them which they filed with a particular papal court. Things get even more interesting when you combine the forces of the RG and the RPG with online databases of the Germania Sacra project of the Akademie der Wissenschaften in Göttingen. Recently the Klerikerdatabase for research about medieval German clerics has been redesigned. At Göttingen a number of the original volumes of the Germania Sacra have been digitized and made searchable online, too. This month an additional Personendatenbank has been launched for searching persons in both these volumes and the general database. The Pius-Stiftung in Göttingen has under its aegis the series of editions and regests (systematic summaries) of medieval papal charters, such as the Germania Pontificia. Better than complaining about the absence of a digital edition of these vast series at its website is going to the digital version of the Regesta Imperii at Mainz and the accompanying online bibliography or using the numerous online resources provided by the Monumenta Germaniae Historica (MGH) in Munich. Stanford University has digitized twelve volumes of Italia Pontificia, but I had rather not present here a tour of charters online when this is given abundantly elsewhere, for instance at the university of Munich. A link with the Germania Pontificia is provided by the online database of Italia Regia, a database aiming at an overview of charters issued by medieval kings and emperors, placita (court records) and pontifical charters for the Regnum Italiae. The subtitle of this Italian-German project, “Il potere pubblico nei secoli VII-XI. Diplomi, placiti, persone” is telling: public power from the sixth to the eleventh century in charters, placita and people is at stake here. It is difficult to choose other prosopographical databases from Italy. The least I can do is giving the link to the Florentine Tratte, a database at Brown University on officeholders in Florence between 1282 and 1532, which tends to be used in conjunction with the online catasto (tax register) for Florence from 1427. In Italy several universities have created online database concerning historic teachers and students. You can for example use a database on medieval scholars at Siena and Perugia or use the onomasticon for Perugia. The database Ut per litteras apostolicas published by Brepols gives its subscribers – mainly libraries – access to the volumes with papal letters edited in the French series Registres et lettres des papes du XIIIe siècle and the sequel for the fourteenth century, two major source series. For the letters of pope Clement IV (1265-1268) you can find a preliminary version of a critical edition of 556 letters prepared for the MGH by Matthias Thumser at the Freie Universität Berlin. Brepols offers also subscriptions to Europa Sacra, a database with 30,000 records on medieval bishops, archibishops and patriarchs from the standard works by P.B. Gams, Series episcoporum ecclesiae catholicae (Regensburg 1873) and its successor, C. Eubel and others (eds. ), Hierarchia catholica medii et recentioris aevi ab anno 1198 (Münster 1898-). To me it seems at first sight that you have to use the newer databases already mentioned here to supplement and rectify data in Europa Sacra. For information on late medieval and later bishops the website Catholic Hierarchy often is helpful, but alas unsourced. For France, too, projects concerning medieval clerics exists. The Fasti Ecclesiae Gallicanae are the modern sequel to the volumes of Gallia Christiana in provincias ecclesiasticas distributa (…) (15 vol., Paris, 1715-1865). It includes bishops, canons of cathedral chapters, abbots and other ecclesiastical dignitaries. At his blog Pecia Jean-Luc Deuffic has listed links to digital versions of both these volumes and the three volumes of the Gallia Christiana novissima (1895-1900). The website of these French fasti points to similar projects elsewhere. You encountered here already the Germania Sacra and the Fasti Ecclesiae Anglicanae, but Helvetia Sacra and the Fasti Ecclesiae Portugaliae deserve mentioning, too. The Laboratoire de Médiévistique Occidentale de Paris (LAMOP; Université Paris-1 (Panthéon-Sorbonne)) has more cards on its sleeves. Recently it launched the Base des collegiales séculières de France (816-1563), a database for searching medieval secular chapters, secular meaning here not following a particular special rule for canons at collegiate churches. At Paris a website has been developed with data on clerics at the cathedral of Meaux, accompanied by a more general site on this project including maps and a bibliography; one has to register to get access to the database. Another prosopographical database from the LAMOP is Opération Charles VI, a database with people active during the reign of the French king Charles VI (1380-1422). By now it is no surprise the LAMOP offers this academic year a seminar on medieval prosopography. For this discipline a journal exists, Medieval Prosopography, published since 1980 by the Western Michigan University. For modern history Oxford University has created an online tutorial for prosopography. The tendency for research along national lines is deplored at this Oxford website, and yet the new project for Scotland seems to be blissfully unaware of the dangers of limits along arbitrary borders. In fact the very way Scotland broke apart from England spurred this project. Interestingly some projects concerning Germany use the borders of the former Holy Roman Empire, including parts of Italy and the Low Countries. At the Germania Sacra website you will find a useful selection of links to projects for university registers (Matrikel) from Germany and in particular the Repertorium Academicum Germanicum (1250-1550). I guess it is wise with such projects to set yourself some borders in order to escape from starting an all-compassing or even utopian project. It might drag on infinitely or end as a dead-end indeed, by lack of funding or real scientific importance, because aims, methods and standards might easily have developed in different directions during the long periods in which such projects run. The same wisdom helps me to end this post here. It is certainly not the definitive guide to online medieval prosopographical databases with particular relevance for legal historians. For medieval Britain the website on medieval genealogy offers a detailed presentations of online resources for medieval biography and prosopography. I skip even the customary Dutch twist, for example with online university immatriculation records for Dutch universities, but I give you in exchange the link to a database on Belgian magistrates from 1795 to 2005, Just-his, a website of the Université Catholique de Louvain. However, if you think that it is easy to expand on this post, please send me your comments and additional references! Utrecht University has a fine website on its professors since 1636, the Catalogus professorum Academiae Rheno-Traiectinae. Medieval prosopography is a prosperous research field. Earlier this year I had already noticed in a post the website Prosopographia Burgundica, and I simply did not remember writing about it, but it deserves inclusion here. This entry was posted in General and tagged Byzantine law, Legal history, Medieval canon law, Medieval law on October 17, 2012 by rechtsgeschiedenis. Choosing a subject for the first post in 2010 took some time. It had to be connected in some way to Roman law. After some reflection Byzantium came to my attention, and again a exhibition forms my point of departure. The Kunst- und Ausstellungshalle der Bundesrepublik Deutschland in Bonn presents “Byzanz: Pracht und Alltag” (Byzance, Luxury and Daily Life) from February 26 to June 13, 2010. If you have read for instance Judith Herrins Byzantium. The surprising life of a medieval empire (2007) you will realize once more the great historical importance of Byzantium and of Istanbul, the former Constantinople. Those familiar with legal history will no doubt remember that thanks to Justinian, a Byzantine emperor, the Digestae was compiled, the great anthology of classical Roman law. Several online versions of it exist, including a version with several search functions at IntraText. The most important Byzantine legal book, the Basilika from the tenth century, is a translation of texts from the Digestae and the Codex Justinianus. A Dutch scholar from Groningen, Herman Jan Scheltema, published a critical edition of it (Basilicorum Libri LX (17 vol., Groningen 1953-1988)). The department of legal history at Groningen University has a proud tradition of research in Byzantine legal history. On their private (!) website for Byzantine law you can find out more about their scholarly and other activities, such as a small publishing company. Let me just mention that in 2009 the eight volume of the journal Subseciva Groningana has appeared. In the field of Byzantine law international cooperation is necessary. The Max-Planck-Institut für europäische Rechtsgeschichte at Frankfurt am Main does not only publish its own Forschungen zur Byzantinischen Rechsgeschichte – and useful preprints of the second volume of the repertory of Byzantine legal manuscripts – but is with Groningen and other institutions active in an European network of scholars active in this discipline. Byzantine studies and Byzantine legal history are somewhat separate disciplines, and while recognizing their independence it would be wise not to let them drift too far from each other. Anyway, you can search for manuscripts with both legal and other texts in Greek using Pinakes: textes et manuscrits grecs, an online database of the Institut de Recherche et d’Histoire des Textes in Paris. A postscript: at Frankfurt a number of sources for and books on Byzantine law have now been digitized, among both volumes of the Repertorium der Handschriften des byzantinischen Rechts (2005 and 2011). This entry was posted in Exhibitions, General and tagged Byzantine law, Roman law on January 9, 2010 by rechtsgeschiedenis.